In the ultra-competitive Ultrabook market, HP has to contend with many respected brands that all see this as a highly lucrative sector. The Elitebook designs offer a very wide range of performance and price points, with the 840 G5 being on the higher end of that sliding scale. What buyers can expect is a full bells and whistles experience where performance matches the best available from any provider. Oddly, the provided review model was a 3JX09EA variant, one that’s not yet available on either the UK or US inventory for the HP 850 G5. Although it is very similar to the 3JX31EA, 3JX94EA and 3RF15UT models that can be bought in most regions. In the US, the 3RF15UT with the same screen, memory and storage an costs $1,769.00 (£1,322). Whereas the 3JX94EA sells in the UK for £1,366.80, although it has 8GB of RAM, not 16GB. Considering that this machine has a touchscreen and a high quality of construction, that price compares favorably with Toshiba, Dell and other popular Ultrabook brands. The HP EliteBook 840 G5 represents the classic struggle between pure aesthetics and practical functionality. Where appearance might be paramount elsewhere, here it never overrides practicality, delivering a design that looks stylish, but avoids any design choices that might be considered radical. The first thing that struck us is how well made this device is without falling into the obvious trap of over-engineering. This chassis succinctly avoids any sharp edges or flexible structures, as these things should. The appearance is that it is entirely metal, but that’s a subtle illusion. The cleverness of the HP Engineers is that the plastic is mostly restricted to those locations where wear-and-tear won’t normally reveal it. The top lid is metal skinned, has the new hyper-stylized HP logo embossed into it, and feels invitingly cool to the touch. The underside is plastic and less visually appealing, as you won’t be seeing it often. Opening it up, reveals a spacious backlit keyboard, with an integrated pointing device. The touchpad is of the highest quality, has both buttons at the top, and more under a flexible edge at the bottom, and is also compatible with Microsoft Precision Touchpad default gestures, for those who have learned them. Port placement is exclusively on the sides, with the vast majority being on the right. With the majority of users being right handed, that makes plugging in things easy, although those who insist on using a mouse might find this less helpful. On the left is a single USB 3.1 Gen 1 port, and on the right is another plus a single Thunderbolt Type-C, HDMI 1.4b, RJ-45 Ethernet, 3.5mm headphone/microphone combo and a proprietary docking connector. It might seem silly putting both the docking connector and Thunderbolt on the same machine, but HP sells docks that address both connection methods. For those that like accessories, the Thunderbolt dock costs much more than the HP proprietary variety, sadly. For us, the best aspect of the 840 G5 was undoubtedly the screen. Depending on the model, there are no less than eleven different panels offered on this chassis, including a single 4K option. The other ten, like the review hardware, have 1080p IPS displays that have 220, 400 or 700 nits of backlighting. The variances beyond resolution are grouped by the inclusion of touch, the camera spec (i.e. if it supports IR mode for Windows Hello) and an optional ambient light sensor. The review machine was blessed with an FHD (1920 x 1080), 700 nits, 72% CG, eDP+PSR, ultra slim panel with the HP Sure View privacy mode and HD+IR camera. This is easily one of the best displays we’ve seen on an Ultrabook, enabling a clear view in any lighting conditions. And, the 1080p resolution works well in a 14-inch format without needing any radical interface scaling in Windows 10. However, we’d avoid any models with the 220 nit panel, as those numbers hint at a much less impressive experience. As part of the display structure, HP also included Bang & Olufsen speakers that kick out significantly more bass frequencies than we expect from a laptop. A useful addition for presentation work, should you not have a sound system handy. 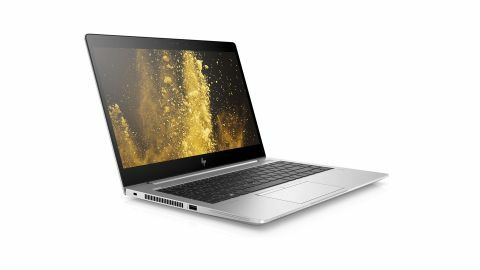 Our only reservation about the EliteBook is that HP still insists on using a proprietary power connector when this machine has a Type-C Thunderbolt port that could be made dual-purpose. In summary, the EliteBook 840 G5 is classy from the outside, but can the internal hardware live up to the billing of the outside? The standout parts in this variant are the Intel Core i7-8550U quad-core processor that can Turbo Boost to 4GHz, and a lightning-fast 512GB NVMe SSD. This 8th-generation Intel CPU is easily comparable with a good desktop processor and offers four cores and eight thread processing. The storage provided is a Samsung PM981 that we’ll talk about in more detail in the benchmarks. A machine of this spec from almost any maker will be costing in the $1,350-1,750 range, almost irrespective of the source. And, those that cost less will have undoubtedly cut corners on the display or overall build quality. One minor weakness listed here is the HDMI 1.4b port, an output that has a limit of 30Hz in 4K. A limitation of the HDMI port at this level, it may be possible to get 4K 60Hz from the Thunderbolt port with a suitable adapter.